“I thank my God every time I remember you. In all my prayers for all of you, I always pray with joy because of your partnership in the gospel from the first day until now, being confident of this, that he who began a good work in you will carry it on to completion until the day of Christ Jesus” Philippians 1:3-6. On my drive to work the other day I was listening to a local Christian radio station, and the hosts were talking about ways to simplify Thanksgiving Day. I’ve decided to apply one of their ideas. Here’s the simp le tip: Make only tried and true dishes that everyone enjoys. And instead of adding new recipes to the menu simply make larger portions of those “oldies but goodies.” You know–sweet potato casserole, green bean casserole, Pink Stuff (the Fletcher’s name for fruit and coolwhip salad), and pumpkin pies. This not only keeps the cooking simple, it also keeps the grocery bill down. Of course, don’t forget the turkey and dressing. A friend of mine said that she always uses the box stuffing mix, and just adds some broth from the turkey, to give it that “homemade” taste. Simplifying the Thanksgiving Day meal, in theory at least, is probably much easier to do than simplifying the overall family gathering. For instance, when you have grown children who are married and have the other side of the family to consider, it can become a little stressful in determining which home to eat the big meal at, or whether or not to rotate homes from year to year, etc. I’m sure there have been some major family feuds over this one! This is definitely not the case for us. My husband and I have repeatedly told our children that we are completely fine having the meal whenever, and with whoever wants to join us or not. Let’s just keep the peace and be thankful for the blessings we have year round, not just on Thanksgiving Day. After writing in my blog now for over a year, I’ve decided to take some time off, at least until the beginning of the New Year. The reason for this is so that I can take to heart and put into practice the thoughts I’ve so passionately been writing about. Sometimes I believe It’s much easier to write about ways to be intentional in living out one’s faith in Christ, than it is to actually live them out! I guess I’ve been a little convicted lately from reading my journal entries. For instance, the Holy Spirit recently laid several people on my heart and mind. Without going into any specifics, I have realized that even though I have taken time to pray for these dear ones, I haven’t done anything else. My excuses: I’m too tired, I don’t have the time, does God really want me to do that? So, starting today, I am going to intentionally stop writing in my blog. And prayerfully I will begin to follow-up with people God places on my heart. It’s not so much that I think this will give me any extra time, because journaling doesn’t really take up much of my time, and it definitely doesn’t require me to give up any sleep. I do believe this is what God is asking me to do. And I truly want to follow His lead. I pray that all of my blogger friends will be blessed by God’s holy presence on Thanksgiving Day. Building a Legacy of Faith ~ Boots…Am I in Style? “3Do nothing out of selfish ambition or vain conceit. Rather, in humility value others above yourselves, 4 not looking to your own interests but each of you to the interests of the others” Philippians 2:3-4. Personal Reflection: Boots…..Everyone seems to have a stylish pair of boots, but me. Who doesn’t want to stay in style? 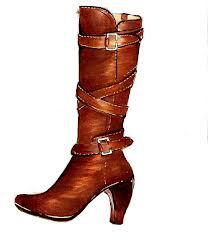 Why have I even noticed that so many women are wearing fashionable boots? Is it because I am feeling a little envious of what others have, or is it because I just don’t want to be considered unfashionable? I’ve been searching my heart lately as these thoughts popped into my mind. I’ve come to the realization that I must not be alone in these thoughts. Otherwise, there wouldn’t be so many women wearing boots, right? Then I think about the recent disaster that hit the Philippines, leaving potentially thousands dead and so many more missing and homeless. Why am I not much more concerned for those who are going through such horrific pain and suffering, than simply wasting my thoughts on boots, of all things! *Note: About a year after writing this, my husband (Pappy) gave me a pair of brown boots for Christmas. My first internal thought,”Oh, I had hoped to go without getting a fashionable pair of boots.” Then I quickly felt delighted that Jeff had given me such a thoughtful gift. The following Christmas I bought myself a black pair. While making a few edits of my original Covenant Heirs blog (to prepare for publishing a legacy book for my family), I re-read this blog. Personal conviction once again resonated. “Help me Lord, to set aside those things that deter me from pleasing you and make me look more like the world rather than my Jesus.” I don’t intend to be legalistic, but desire God’s wisdom in making eternal choices that reflect Jesus. This brief personal reflection is a good place to contemplate what type of messages we are sending to our kids and grandkids. Consider these options. – Praying for those who are hurting. – Donating nice or even better yet, new clothing to the Salvation Army or other compassionate ministry/organization. – Volunteering time serving those who are less fortunate. – Praising God and giving Him thanks for all the “things” we do have. – Sacrificially giving up something that I want, so that I can provide a need for someone else. – Spending time with someone who may be overlooked by others. – Inviting someone who is going through a difficult time over for a meal and conversation. + Call someone who you haven’t talked to for a while, just to let them know you care about them. And, or: Write notes of encouragement and mail them to that special someone. + Bake some goodies for someone who needs cheering up. + Invite a neighbor(s) over to play table games. + Mow, rake, shovel snow, for someone who is physically unable to accomplish these tasks. So whether I choose to conform to the stylish pattern of this world and purchase a pair of fashionable boots or not is really not the real question. The truer question I must answer: Am I willing to love others by giving up something that I “want” just because I wish to be in style? This isn’t even much of a sacrifice, is it? I really need to give up things that cost me something, such as my time. See below for a list of organizations where you and your family can volunteer time and resources. Take an empty boot and begin filling it with loose change. Sacrifice money that would have been spent on a family pizza or family activity like bowling, and instead, add it to the boot collection. In advance, designate a family care project such as: Purchase a new winter coat to donate to a homeless shelter, or purchase food for a Thanksgiving meal, to be given to a person or family who would not be able to purchase their own meal. When the boot is full, use this money to accomplish your family care project. Repeat the Fill-a-Boot with Love by designating a new family care project. It is unclear (at least to me), who first coined the phrase, “A picture is worth a thousand words,” however, this is what comes to my mind while writing this journal entry. Seven years ago my husband received a gift, of sorts, enabling him to purchase a beautiful canvas reproduction of In the Wilderness painting, by artist Ron DiCianni. 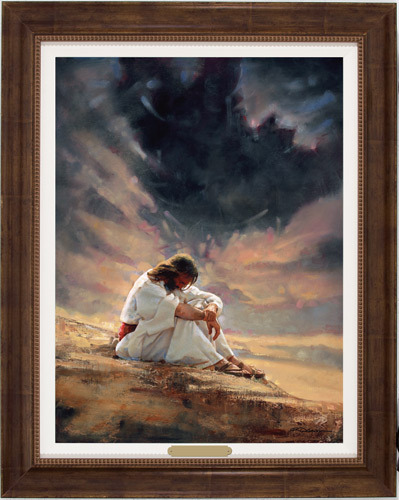 The large framed painting of Jesus hangs on the hallway wall leading to an upstairs bedroom and office. The “picture” of Jesus can actually be seen from our front entryway, but it draws the most attention when I carry my grandchildren upstairs for their naps. Our two and half year-old grandson, Max, recently exclaimed to me and to his cousins: “Jesus is here!” as he joyfully ran around our house pointing to the picture of Jesus. Yes, a picture is worth a thousand words…and so much more, when it depicts the love and truth of Christ. I believe it is very beneficial for Christian parents/grandparents to display images (décor items) in their homes, symbolizimg their faith in Christ. In doing so, it opens the door to share one’s faith with children, grandchildren, friends, and neighbors.